The Nentsi breed was developed by the Nentsi people. In the 1930's breeding work began on a large scale and considerably increased size, strength and productivity. The Nentsi breed is reared in the north of Russia and to the east of the Urals, i.e. in the lower reaches of the rivers Ob and Yenisei. In the past Murmansk region was the breeding area of the Saami strain (Murmansk breed) but in the 1930's it was replaced by the Nentsi breed. At present the Nentsi breed numbers more than 850,00 head. This is a homogeneous group of animals of average size (as compared to other breeds), strong body build and mainly light brown in color. 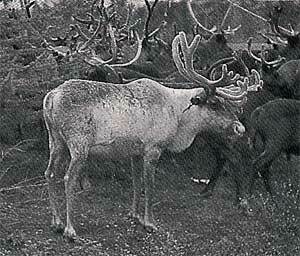 Natural and climatic conditions in areas where Nentsi reindeer are bred are relatively monotonous. This is a low-lying country, in the main, with occasional ranges of low and medium mountains (the Khibini Mountains, the Urals), considerable precipitation in winder and comparably warm summers. The average temperature fluctuates from -0.5 to 3.8c. In summer the herds graze mainly on the Arctic coast in the tundra zone, which has abundant green vegetation, while in winter they are driven into the forest tundra with its profusion of feed lichens and protection from wind. A characteristic feature of this breed is that they feed chiefly on reindeer lichens for 8 months (from October to May). As the lichens do not contain sufficient nutrients, the animals' weight falls sharply toward spring. Rutting occurs at the end of September through October. Females usually give birth to one fawn. The fawn crop in years with favorable feeding and weather conditions is 85% and in pedigree herds up to 93%. 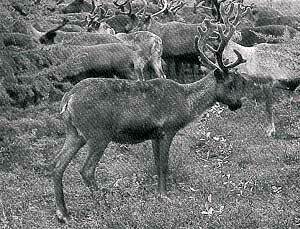 The typical diseases of Nentsi reindeer are gadfly strike, necobacillosis and pneumonia. Some animals are resistant to these disease, but the question still requires proper investigation. Nentsi reindeer are perfectly adapted to local natural and climatic conditions. Transferring them to regions lying more to the south ended everywhere in failure. the animals perished within 2-3 years. The Nentsi breed is the most uniform and fixed one. Bigger animals are to be found on Arctic islands such as Kalguev and Vaigach. According to scientists this is die to favorable feeding conditions and is not due to genetic differences. The use of island sires in mainland herds did not bring about an improvement. There are 30 pedigree herds of the Nentsi breed with the area. For many years the breeds work was carried out in experimental production farms of agricultural research institute of the Far North, of the Murmansk experimental reindeer breeding station and of Yamal and Naryan-Mar agricultural experiment stations. The Nentsi is considered to be the most numerous and successful breed. however, because of large-scale industrial activity in a number of regions the ares os lichen winter pastures is being reduced, which can have a negative impact on the local reindeer production. Copyright © 2003, Oklahoma State University Board of Regents. All rights reserved.